Dead Sea Mineral bath salts create a relaxing and invigorating atmosphere with active mineral ingredients from the Dead Sea. The use of Dead Sea bath salts at home is an effective way to relax and absorb the minerals of the Dead Sea. 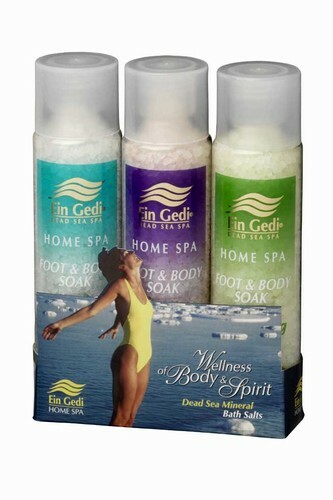 Research has proven the efficiency of Dead Sea bath salts in alleviating skin diseases such as psoriasis. It is also highly beneficial for relieving muscle tension or for simply relaxing and enjoying a rejuvenating experience. The beneficial effects of the Dead Sea's raw materials on the skin and their unique therapeutic and beautifying powers have been recognized since ancient times. Cleopatra, considered the most beautiful woman in the world, went to great expense to obtain exclusive rights over the Dead Sea area. At her command, pharmaceutical and cosmetic factories were built near the Dead Sea. Use this product for stimulating, tightening, cleansing and invigorating, leaving the skin with a refreshing glow.